As I've mentioned before, I have a "Things to Do Before I Die" list. I've saved it on the computer, and I add to it occasionally; when I've accomplished something, I highlight it and make note of the date. Well, I've just added "Visit Trinity College library in Dublin" to my list. Thanks, Anali, for the beautiful photo. It is beautiful - visiting it feels like making a pilgrimage to a holy shrine. 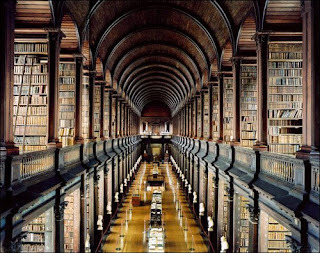 I pay my respects to the Book of Kells, Brian Boru's harp, and the lovely lovely Long Room. I didn't realize this was the Trinity College Library. I've actually been there before! I don't remember it being this shiny, but perhaps the shuffling feet of thousands of tourists dulled the gleam a little. FYI the Book of Kells is much smaller than you'd expect. "Poemhome" - I'd be worried about their help if they had more board books. But Trinity seems to be focusing on the middle grade and YA stuff instead. Easier to keep those books organized. Jennifer - Kind of like the Mona Lisa. It's smaller than you'd think...encased in glass...and you have to look at it from about 20 people deep. One of the greater disappointments in my life. It is a holy shrine. I don't think I saw the harp when I went. I know that I had read Eco's Name of the Rose and thought, this, this is a library.